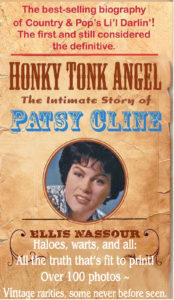 Nor is this the first dramatization of the group’s history. 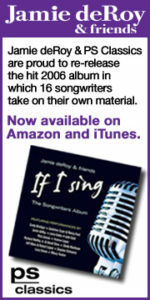 A 1998, four-hour TV miniseries, The Temptations, based on the autobiography of Temptations founder Otis Wilson, got there first. 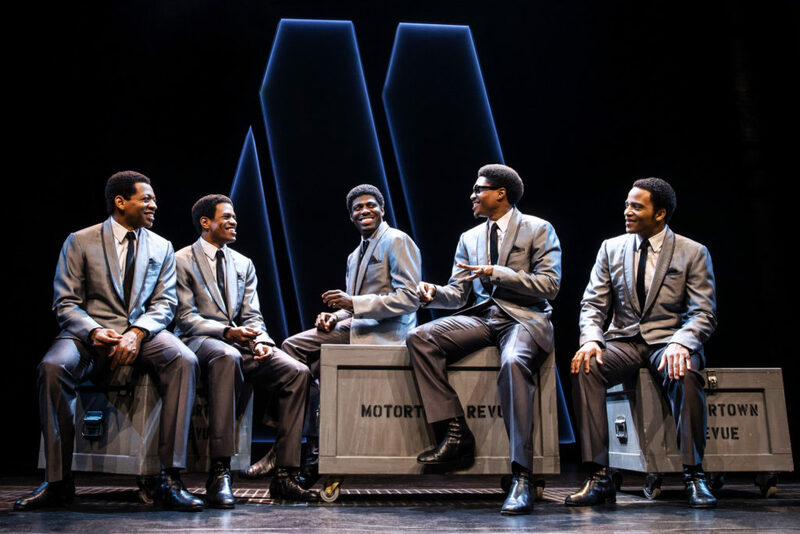 As in that show, Ain’t Too Proud,which had its world premiere in 2017 at the Berkeley Repertory Theatre, focuses on the personalities, career choices, disagreements, and tragedies affecting the men who gave the original group its sound and style. As we learn, there have been 24 Temptations so far. The group continues to exist, and will probably get a big boost from its Broadway exposure, which I suspect will have a long life. 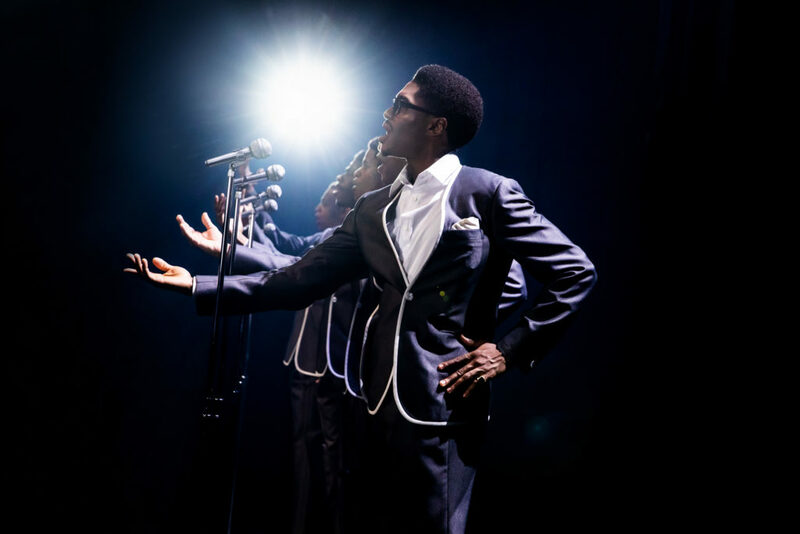 It’s clear, though, that if you belong to Generation Z, and aren’t into Rhythm and Blues or Soul Music of the 1960s and 1970s, you may never have heard of The Temptations, a quintet of African-American singers formed by Otis Williams (Derrick Baskin), born in Texarkana, TX, in 1941, and raised in Detroit. 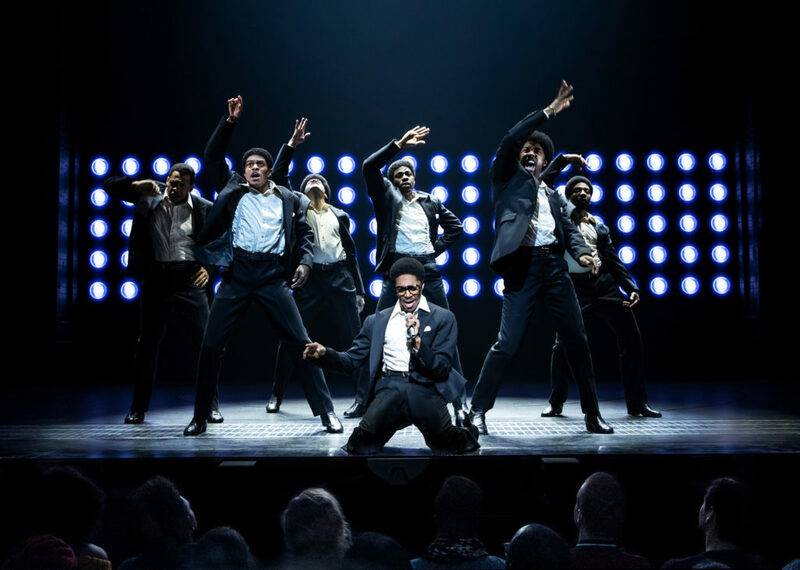 (The show is adapted by librettist Dominique Morisseau from his book,Temptations.) 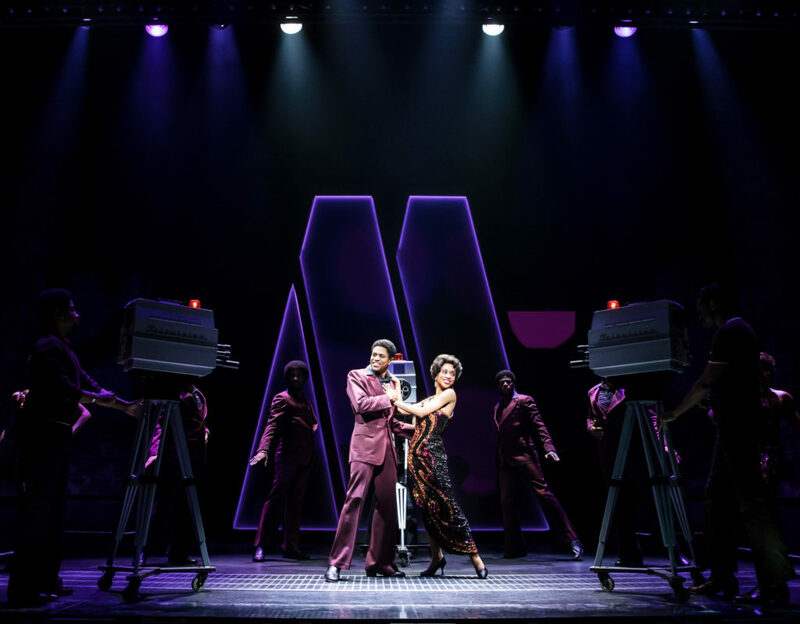 The Temptations found success in the hands of that city’s Motown Records company, led by producer Berry Gordy (Jahl Kearse), himself the center of Motown: The Musical, another recent jukebox show. Sharing or fighting with the Temptations for the R&B/Soul spotlight back in the day were such stars—just to name those who show up here—as Smokey Robinson (Christian Thompson), Tammi Terrell (Nasia Thomas), and the Supremes (Candice Marie Woods as Diana Ross; Taylor Symone Jackson as Florence Ballard; Rashidra Scott as Mary Wilson). 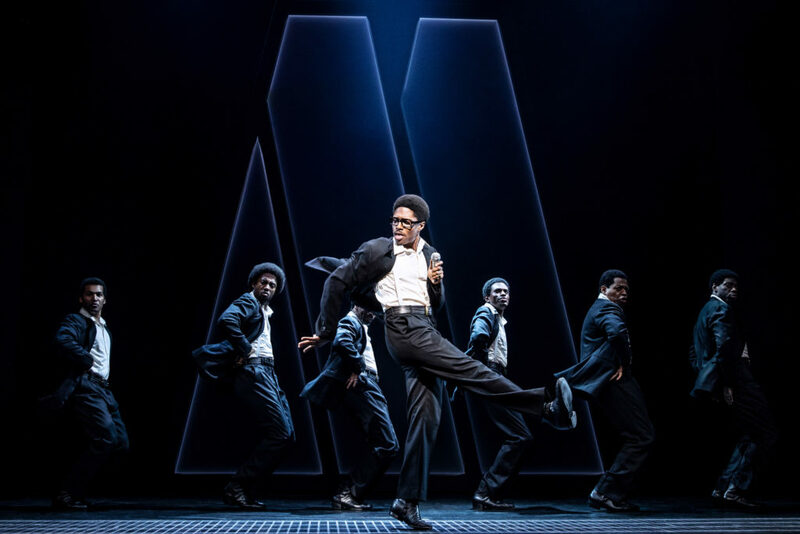 Although they played a big part in Motown: The Musical,and partly inspired Dreamgirls (1981; has it been that long? 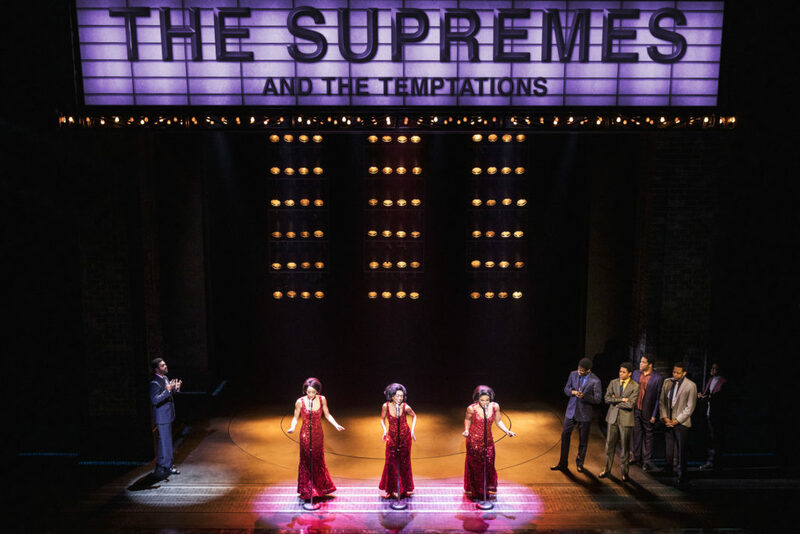 ),seeing the Supremes—in sequined red gowns—reincarnated is surely stirring someone’s mind for another show about them, or Diana Ross, at any rate. 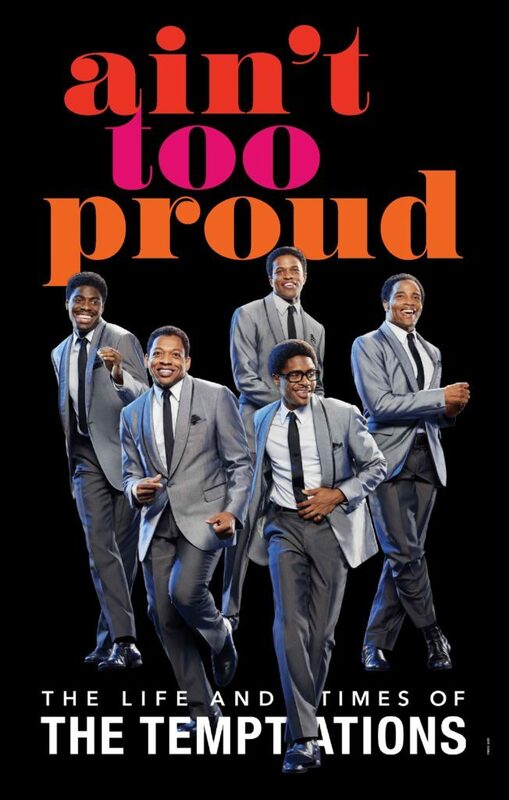 Ain’t Too Proud tells its story through Otis William’s narration, encompassing his experiences in forming the group and in maintaining its integrity, artistically, commercially, and personally. 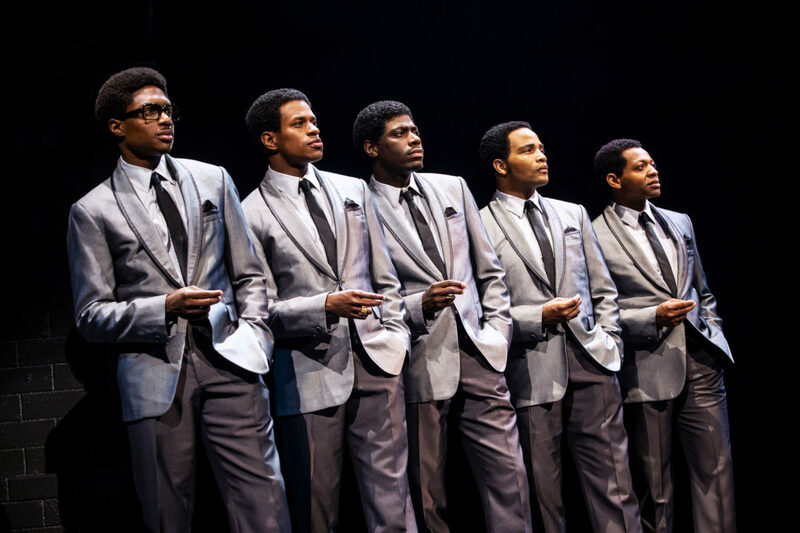 We see the group’s interactions with Berry Gordy, how it got its name after such earlier monikers as The Elgins, how Wilson found its core members—lead singer David Ruffin, Paul Williams, falsetto Eddie Kendricks, and bass Melvyn Franklin (Jawan M. Jackson)—and how drugs, illness, alcohol, ego, and death threatened but never destroyed the group’s existence. Throughout, Williams’s mantra is the group before any of its individuals, which sometimes leads to painful decisions and squabbling. Meanwhile, he endures the travail of marital strain when he’s forced to tour so often he rarely gets to see his son, Lamont (Shawn Bowers), who himself meets a tragic fate. Under Des McAnuff’s enthusiastic direction, the 20-member ensemble, most playing multiple roles, races through the story, as minimal scenic units slide on and off (the abstract set is by Robert Brill) on turntables and treadmills that also move actors on, off, and around, as Peter Nigrini’s projections of theatres, audiences, headlines, city names, and the like flash by. 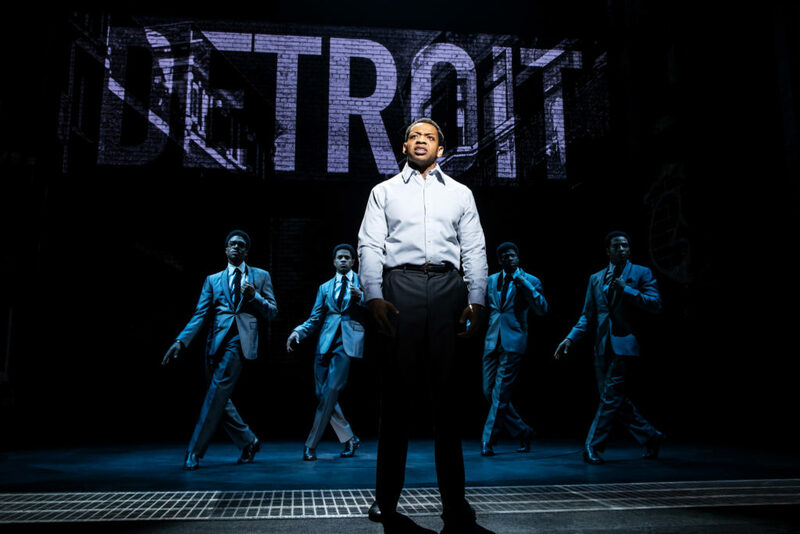 Howell Binkley’s multi-cued lighting never stops changing, as is also true of the versatile cast, which keeps metamorphosing through Paul Tazewell’s countless period costumes and Charles G. LaPointe’s endless succession of wigs. The Temptations were known not only for their sound but for their smoothly choreographed moves, which one can easily see on numerous YouTube videos. Choreographer Sergio Trujillo has taken these gestures, sliding steps, and finger snaps, and injected them with terpsichorean steroids. Fortunately, he’s got a sensational cast to work with, actors who not only sing extraordinarily well but do so while twisting, spinning, leaping, knee sliding, splitting, and doing mic throws and catches, And they do this during so much of their time in this two and a half hour show that you wonder not only where all their talent comes from but what the source is of their unstoppable energy. Here and there instances of overacting arise but the show’s driven dynamics help cover such momentary flaws. 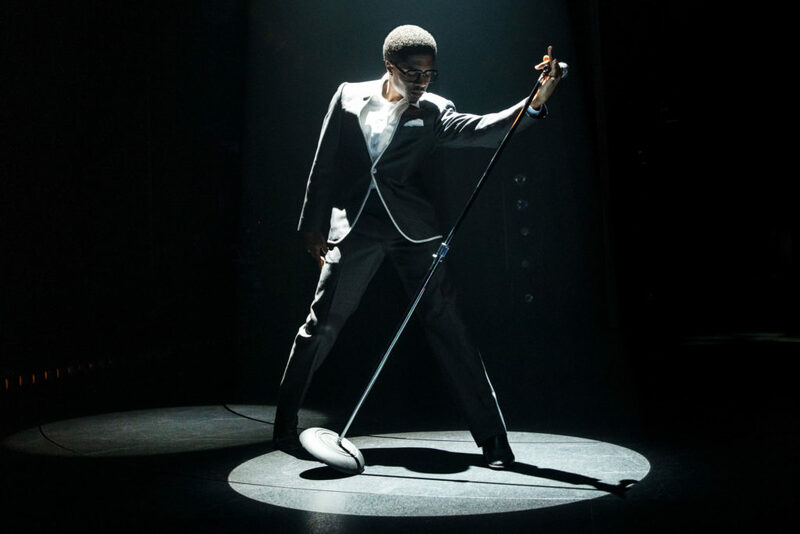 If I were forced to single out two performers, they would be Derrick Baskin, who clearly deserves a Tony nod for a performance hitting all the goalposts, and Jawan M. Jackson, who not only brings conviction to his portrayal as Melvyn Franklin but whose amazing bass voice has to be heard to be believed. Ain’t Too Proud: The Life and Times of the Temptations is by no means groundbreaking, or high art. There’s nothing unusual in its story of fame’s rewards and pitfalls, and it offers little that’s new in its jukebox niche. 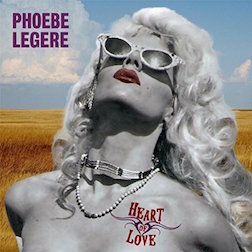 But, as slickly polished entertainment, it comes together beautifully, capturing both heartbreak and joy. 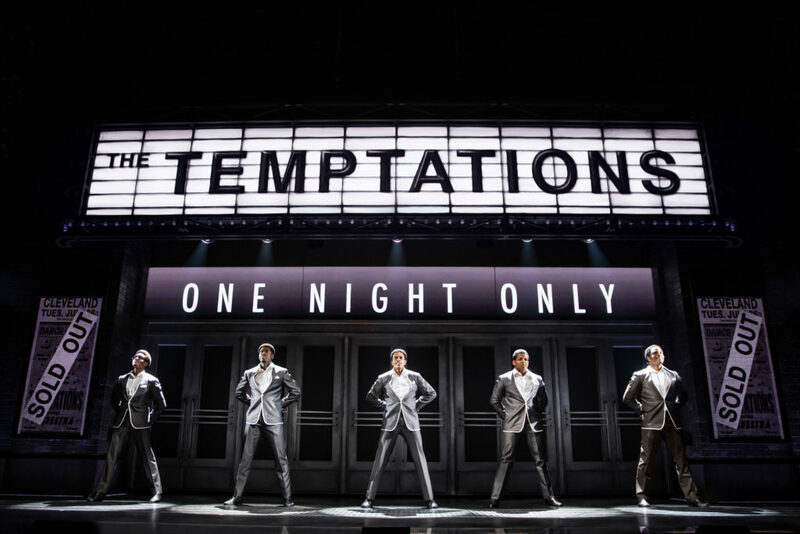 The Temptations may not be your cup of Broadway tea but, if they tempt you even slightly, don’t resist. Even with an unoriginal, decades-spanning, episodic book, they’re gonna make you love them (oh, yes, they will).